My opinion? It won’t happen. Rafa was injured and out of the ATP Tour for two months. That’s like asking Charice Pempengco to tape her mouth for 12 months. She’ll rust. And, yes, Rafa is rusty. Mr. Federer? Ah, he’s far from dusty. Like a gleaming Rolex watch that he wears on his left wrist, the Swiss is glossy and sparkling. Looking back 12 months ago, would you believe that, as the ‘08 US Open started, most tennis experts had called for Roger’s demise? (Me included.) Last year, he lost the Australian Open and, at the French Open and Wimbledon, he lost to Rafa. The same with the Olympic singles gold medal. It was Rafa’s. Roger lost. He was lost. Then, like his stinging forehand that he whips out of his magic pocket to score a winner, Roger won the 2008 US Open title. Fast forward to Paris and London a few months ago, he also wins the twin majors plus, as added bonus, a pair of twin girls named Myla Rose and Charlene Riva. Today, Federer is not in Cloud 9—he’s floating in Cloud 15. That’s the number of Grand Slam singles titles he’s amassed. Call it “Love-Fifteen.” Roger loves 15. Will it be 16 next weekend? I bet my dog Bruno it will. A five-time US Open winner—consecutive, I might add—I can’t see anyone beating the Swiss in New York. Rafa? He’s still sluggish. Djokovic, the No.4 seed, has not gone past the quarterfinals of the past three Grand Slams. There’s Tsonga, Verdasco, Monfils—but they’re all chess pawns to The King, Roger. Andy Murray is the only one I see threatening RF. The two met in last year’s US Open final and, since that Roger win, the Scot has beaten the Swiss in four of their last five encounters. Murray has gotten slimmer, fitter, stronger. He has excellent hands—notice his unexpected drop shots, his effortless underspin backhands, how he moves opponents left to right like a Honda Jazz windshield wiper. The difference between A.M. and R.F.? Love-15. Andy has “love” (zero) majors while Rog has 15. Roger has remained almost injury-free throughout his career. Compared to Nadal who, at only 23, is suffering from knee tendinitis. The reason is obvious: Rog is uncomplicated and smooth while Raf is laborious and excruciating. The former results to less injuries; the latter, well, eight weeks off the Tour. I saw this for myself. At the Beijing Olympics last year, my wife Jasmin and I had the chance to sit on Row 2—meters away from where R & R played separate opponents. With Rafa, you can see the muscles flexing; he’d jump, scramble, sprint, flick his wrist like it would snap. He’s too physical—and too likely to get injured. Roger is a ballerina on rubber shoes. He doesn’t run, he skates. Glides. He hovers. Waltzing around the tennis rectangle, he skims. Sails. He tiptoes. The result? His body’s not battered. Plus, by next Sunday, the Daddy will carry his 6th US Open trophy. klaro kaayo ka nga fan ni federer ahhahhahhahahh…ayaw sad pasaway oi, tanang fans sa ilang idol all praise jud na…kataw-anan gyud mo…. ma idol niinyo sa sports, entertainment, music, movies hahahahhah makatawa jud uban tawo ninyo..then mapildi o sawayon ila idols masuko ra ba dayon…. federer has no grand slam champions around to play against. sampras nearly beat federer at msg he? lost in the 3rd set tie bracker. sampras beat federer in asia 2 years ago. sampras being ten years older 6 years retired. this generation of tennis stars can’t volley they lack court skill and touch. 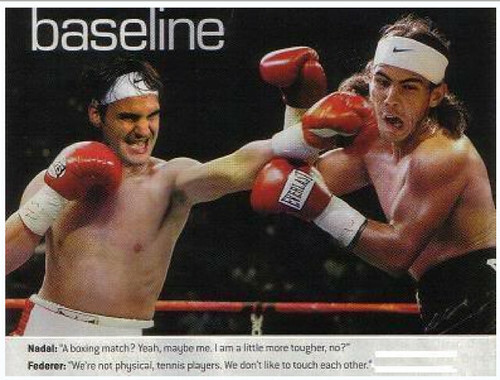 federer has had a easy life. now he faces nadal who owns him. we will see how good federer is? i predict nadal will reclaim number 1 and win us open. nadal owns miami vice federer 13 to 7 head to head. now a man like federer they call him the? greatest of all time. for what? he cant beat his main rival. federer had a easy life no grand slam champions around to beat him. edberg would have owned federer so would have lendl, connors, wilander, becker, sampras etc! federer meet nadal he couldn’t beat. so he cried the sook ruined it for nadal federer made nadal feel bad. nadal said sorry to him. the sook came to wimbledon dressed like miami vice.